Monster Energy Supercross: The Official Video Game is the best pure dirt bike racing game we’ve had in a long, long time. By focusing just on indoor supercross racing and nothing else, the gameplay is absolutely perfected here instead of feeling watered down like in so many other MX games over the years that tried to cram too many “xtreme” things into one title and not getting any of them quite right. 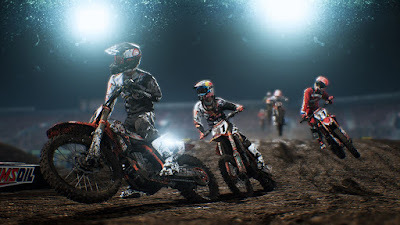 Monster Energy Supercross is fun and realistic and satisfying enough that fans of the real sport and video game dirt bike racing aficionados alike will have a great time with it. Continue reading our full review of the PS4 version for more. If you aren’t already a supercross fan, here’s the Cliff’s Notes. Supercross events take place (mostly) inside large football or baseball stadiums (with the one exception being a track built on the front stretch at Daytona Superspeedway). Because there is only a limited amount of space to use, the tracks snake back and forth and wind around and are really quite cleverly designed. Tracks have corners and jumps and rhythm sections and “whoops” (lots of little bumps the bikes basically just skim over if they’re going fast enough). The racing action is fast and frantic as riders search for different lines around the track or take jumps at different speeds / rhythms to try to go as fast as possible. The racing is also strategic as forcing an opponent to slow down or go into a corner at a different angle can affect the next straight and allow you to pass them. There are two classes that race separately – 250SX and 450SX with a decent power / speed difference between the two– where the 250SX is the up and coming younger riders while the 450SX class are the established stars. Seriously, though, supercross is awesome. I’ve been to real events and it’s always a good time. 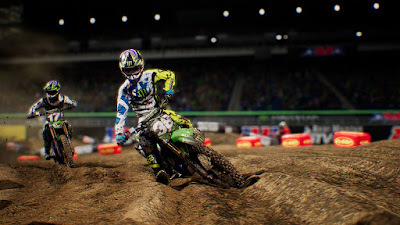 Monster Energy Supercross: The Official Video Game features all of the bikes, sponsors, venues, and many of the real riders from the 250SX and 450SX supercross series. The included tracks are all re-created for the game based on the real tracks used in the 2017 supercross season. For fans of the sport – and there are lots of us considering events fill giant football stadiums every week – Monster Energy Supercross The Game is fantastically faithful. While it may seem odd that the game uses the 2017 season as a basis, that is because the 2018 season is currently going on right now when the game releases. You can still play on the tracks (or at least close facsimiles) from the 2018 season, however, thanks to the game’s fantastic track editor. The track editor lets you choose the size of arena and then place corners, jumps, whoops, and more pieces of various heights and sizes. It is extremely easy to use works really well. I really like that it offers both a top down perspective as well as a simple 3D view so you can really see what your track is going to look and feel like as you build. You can share your tracks, and download other players’ tracks, very easily online, so it’s a great feature that can keep you coming back to the game for quite a while. Modes include single events, single championship season, and career mode and you can adjust race lengths, qualifying requirements (heat races, etc. ), A.I. difficulty, physics, weather, and more for all of them. The game also has extensive customization so you can dress up your rider in real licensed gear and pimp out your bike with new parts from real manufacturers. Online play is available as well. The most important part of Monster Energy Supercross The Game is the gameplay, of course, and it is some of the best the genre has seen yet. Controls-wise the game is fairly straightforward as you have gas on R2, clutch on R1, front brake on R2, rear brake on X, and you steer with the left stick and shift your rider’s weight with the right stick. Knowing how and when to use the various controls – when to clutch, when to shift your weight, etc. – is vital for playing properly and going fast. One thing that is important to remember about supercross is that going full throttle and jumping as far as possible all the time usually isn’t actually the fastest way around a track. You have to learn how to adjust your speed so you time your jumps the right way so you land properly, maintain speed, and set yourself up for the next jump or going into the next corner. Every track is different – and every track feels different depending on whether you’re on a 250 or 450 – so it is a fun learning experience that can be extremely satisfying when you make clean laps and put up good times. “Feel” is always a dumb way to describe gameplay but darn it, Monster Energy Supercross The Game feels really, really good to play. The game does have a bit of a learning curve because of all of this, and I have to admit it took me a few races to really get into the rhythm of everything. I was totally awful at first. Thankfully, the game has a couple of different physics models so you can tone down the realism if need be as well as different A.I. difficulty levels. The game is still quite technical and challenging even playing with assisted physics, but switching to a more realistic physics mode definitely makes it more exciting and satisfying. I also want to say that for some reason reigning 450 supercross champ Ryan Dungey has super powers and is constantly on your tailpipe, which keeps races exciting even on easy and absolutely nerve-wracking on higher difficulties. I do have a couple of complaints about Monster Energy Supercross: The Game, however. First is that the menus are really slow and clunky and make a pretty poor first impression when you start the game. Everything has to load – even between menus - and it’s really slow. My second complaint is that there are some performance issues during races, particularly at the start when everyone makes a mad dash to the first corner. When there are lots of bikes onscreen the framerate really takes a hit (on a PS4 Slim, at least, which is what I have). I also feel, and I hate to say it, that the overall amount of content seems a little light especially when compared to past MX games that had tons of stuff to do. Value is subjective, of course, but it is something to consider before making a purchase. When it comes to visuals, Monster Energy Supercross: The Official Video Game is pretty darn impressive. The bikes and riders are very detailed and look great, but everything going on around them looks fantastic as well. The dirt looks great and you actually wear down the track and make ruts as the races go on. The lighting is also absolutely fantastic. Everything looks awesome during a race but it looks insanely good when you watch a replay. Replays let you change camera angles and really get a good look at everything and the game is absolutely, no hyperbole, “looks just like on TV” stunning. I also have to give props for including two different first-person modes which both look great, even though I struggle to actually race with them. Sound-wise, the game isn’t quite as polished, unfortunately. The bikes all sound fine, but the deep monotone drone of four-stroke engines gets old after a while. The music is generic rock and there are only a couple of songs. 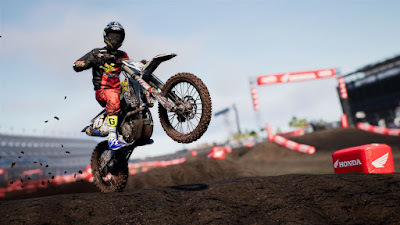 All in all, I can pretty easily say Monster Energy Supercross: The Official Video Game is the best pure supercross game yet and one of the best playing MX games ever. The gameplay is just fantastic and excellent and the graphics are legitimately impressive. It admittedly doesn’t have nearly the content variety of past dirt bike games, but it’s like comparing a 4-ounce filet mignon to 3-pounds of hamburger – there’s a quality difference. When all is said and done, though, I know die-hard supercross fans will absolutely love it, as will any other racing fans looking for a challenging and technically satisfying new title to sink their teeth into. 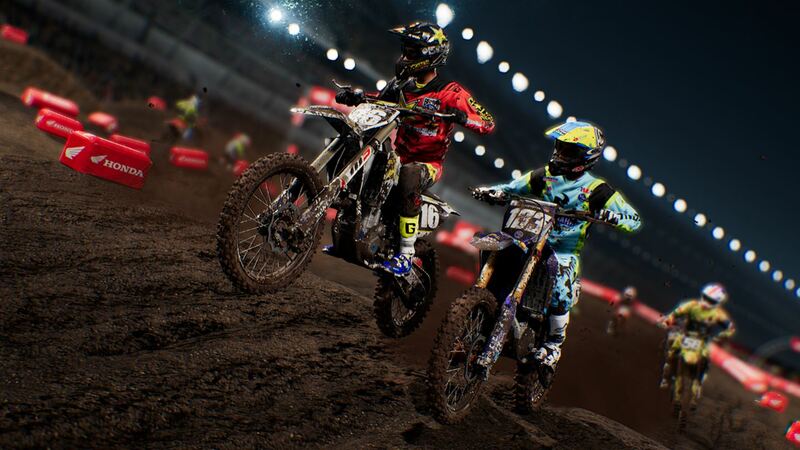 Monster Energy Supercross: The Official Video Game is fantastic and well worth a look.